There is nothing quite like having live music in the home, is there? I especially love when I hear one of the children singing a beautiful hymn as they go about their day. 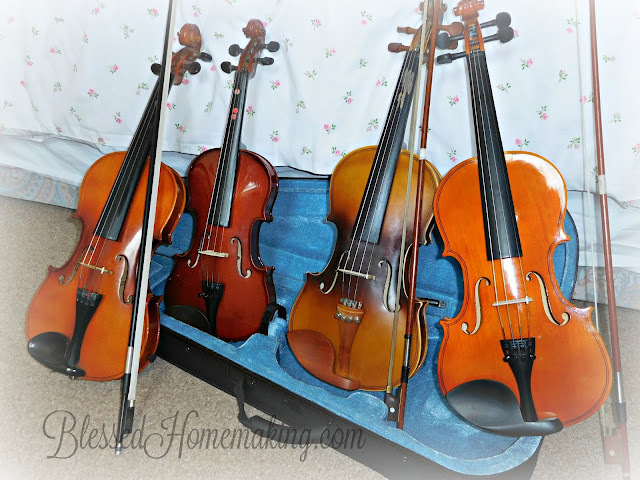 We have been blessed of late to be able to find some second-hand violins to purchase for a decent price. One of our daughters has the desire to teach her siblings how to play, so she was thrilled with the violins we've been able to find. The children were so excited and thought them so pretty that they set the violins up to take several pictures of them together. Cherished of God loves to play fiddle, and can be heard most afternoons playing cheerful songs that flow throughout the house. Now the other end of the house has beginner violinists learning to play, and I am wishing I had the time to learn how to play, myself! But right now is not that time, so I enjoy my children playing and am grateful they have the opportunity. I am hoping to get back to teaching the children piano once again, but right now I have other pressing things I must attend to. I also hope that we will be able to get a better piano some day, as the one we have now is in pretty bad shape, so it will be hard to teach on this. However, a worn out piano is better than none at all! This is another blessing of having your children at home--they have time to learn music! We have so many resources available to us today--some times children can learn music over the internet. If you are looking for a Christian piano course, there is a lovely one available from Madonna Woods. I have used the early levels with my children, and we have been very pleased. Even if you have no experience in music, you should be able to use these, as full instruction is given on the included CDs. It is so much better than the secular music books available, which often have songs included that I'd rather the children not learn.